Adirondack outdoor types tend to be sort of gear crazy. An avid hiker might own two or three pairs of boots, for use on different kinds of trail. No garage is complete without a kayak and a canoe. It’s not uncommon for snow mavens to own three sets of skis, with a pair of snowshoes thrown in for good measure. Being an impoverished reporter (and victim of my wife’s common sense) I’m not as geared up as some, but I do have a weakness: I can’t resist a new guidebook. My shelf holds a couple dozen volumes, detailing Adirondack canoe journeys, mountain bike and hiking routes, rockclimbing venues and cross-country ski runs. And then there are the fishing guides and the diving pamphlets, the accounts of historical treks and the book on hiking trails for kids. 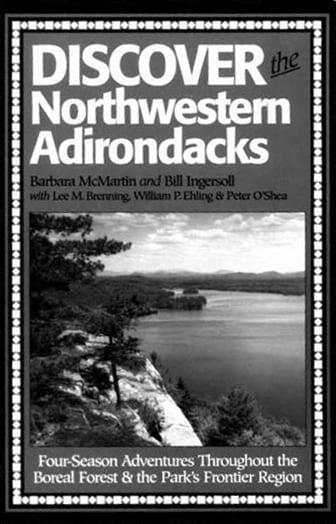 So when the Explorer asked me to review a brand new edition of Barbara McMartin’s Discover the Northwestern Adirondacks I approached the book with a slightly jaded eye. I already owned ADK’s very competent guide to the northern Adirondacks as well as Paul Jamieson’s classic Adirondack Canoe Waters: North Flow (see Page 33). I’ve spent a lot of happy weekends hiking and paddling in that corner of the Park. Did I really need another guidebook? Absolutely. This is an exciting new take on one of the Park’s most rugged and under-appreciated frontiers. The book is full of surprises and fresh ideas. At its heart is a series of essays about new recreational opportunities opened in the last decade. You’ve probably heard about the purchases of Champion International lands and a big piece of the Whitney estate. Those multimillion-dollar deals are still controversial in some local communities. Many hunters and four-wheeler enthusiasts, who had leased the timber company land for generations, will be evicted from their camps. But the land deals were a gift to other recreation users. In the past, big chunks of private land hemmed in hikers and paddlers (and those hunters who couldn’t afford to lease a camp). These deals didn’t just add new acreage to the Forest Preserve; they filled in missing pieces of a massive jigsaw puzzle. 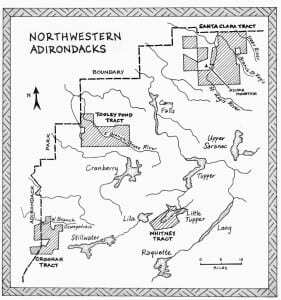 This edition of Discover the Northwestern Adirondacks tells you how to use the new real estate, piecing together canoe routes and new backcountry rambles. Most dramatic is the canoe journey from Little Tupper Lake to Lake Lila. This route re-establishes part of the traditional Adirondack canoe network that existed in the 1800s. But there are also some thrilling opportunities created in the Pepperbox Wilderness near the Park’s western border. Check out the description of the old woods road that offers hikers a new route to Duck and Pepperbox Pond. A good guidebook should also help you take a fresh look at places you’ve already been, and here too this volume shines. I’ve made several trips into the Bog River-Lows Lake area, traveling by land and water. This book gave me plenty of new ideas for exploration. I’m eager to scramble up the cliffs that overlook Hitchins Pond and look forward to spending more time at Grass Pond off Lows Lake. The writing is clear and factual but also personable, a quality I enjoy in a guidebook. McMartin and co-author Bill Ingersoll offer just enough history and anecdote (and even a little gossip) to make you feel like you’re part of a warm conversation. Every so often, you get the feeling that the writers are sharing a secret with you. To uncover some of these bushwhacks must have taken true patience and devotion. Does the book have weaknesses? A few. I found only one factual error. The Mount Arab fire tower is open to the public and a glorious experience, thanks to a lot of hard work by local volunteers. Also, the photographs are only adequate, with none of the inspiration offered by the text. A bigger concern is the map system. 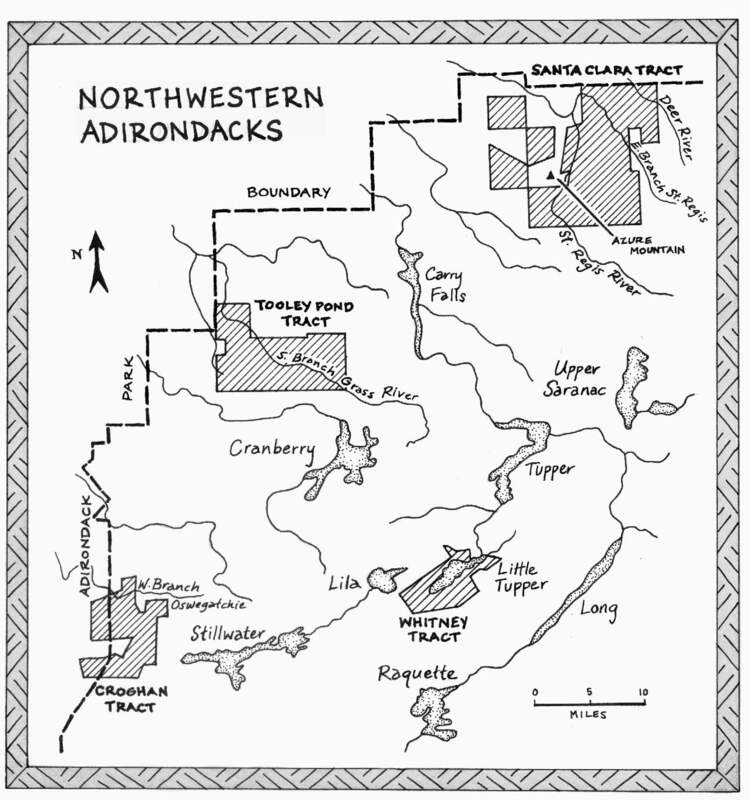 The book breaks the northwestern Adirondacks into 29 roughly overlapping chunks. The contour maps are reproduced in a nearly illegible, photocopied format. Trails are handdrawn over the maps, often leaping from page to page. A map locator on the final page tries to make some kind of sense of this hodgepodge, but the effect is clumsy. with Champion International and Marylou Whitney in the late 1990s. One of the book’s real accomplishments is its “how-it-all-fits-together” thoroughness. Here’s an example: From Long Pond Road, on the far western border of the Park, you can follow Bear Pond Road to an old logging road that leads to Sand Lake in the heart of the Five Ponds Wilderness Pond. From there, it’s possible to plunge straight north, through some of the Adirondacks’ most pristine boreal forest. The hiker can cross the Oswegatchie downriver from High Falls and continue on to Wanakena on the shores of Cranberry Lake. This sort of backcountry odyssey would be far more easy to plan and execute, if the maps were drawn and organized more carefully. That said, this guide has earned a proud spot on my shelf. For folks who already love the northwestern corner of the Adirondack Park, it’s a reminder that more awaits than ever before. For folks who rarely venture past the High Peaks, it’s an invitation to a new frontier. So unpack one of those pairs of skis, or dust off your canoe or kayak, and go sample some true wilderness.